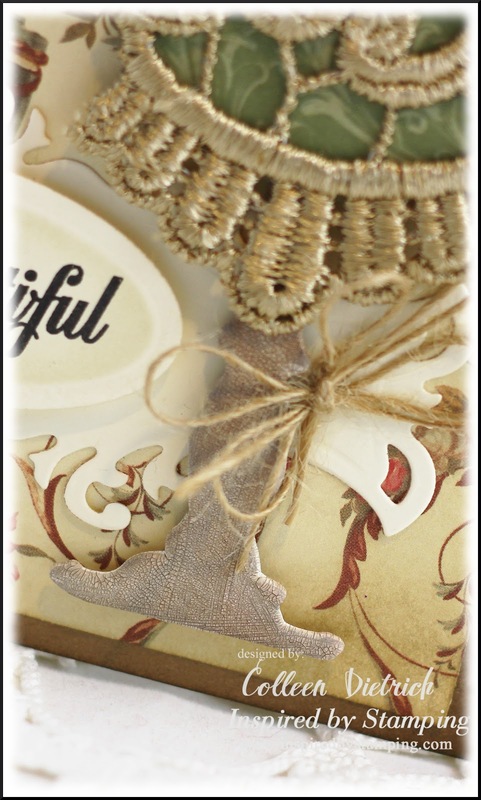 Over at the Inspired By Stamping blog, Joanna Munster hosts a feature called Whoo Hoo Wednesday, where each of the design team members showcases a project or tutorial. It's my turn today, and I'd like to show you a larger-than-A2 Victorian card. I began with a dressmakers form made from chipboard (thanks to my friend Carol for sending me a slew of them! ), and painted it with white Crackle Paint. When the paint was dry and crackled, I sponged on Walnut Stain Distress Ink with a soft, swirling motion, to get it in the cracks. Time for a skirt. 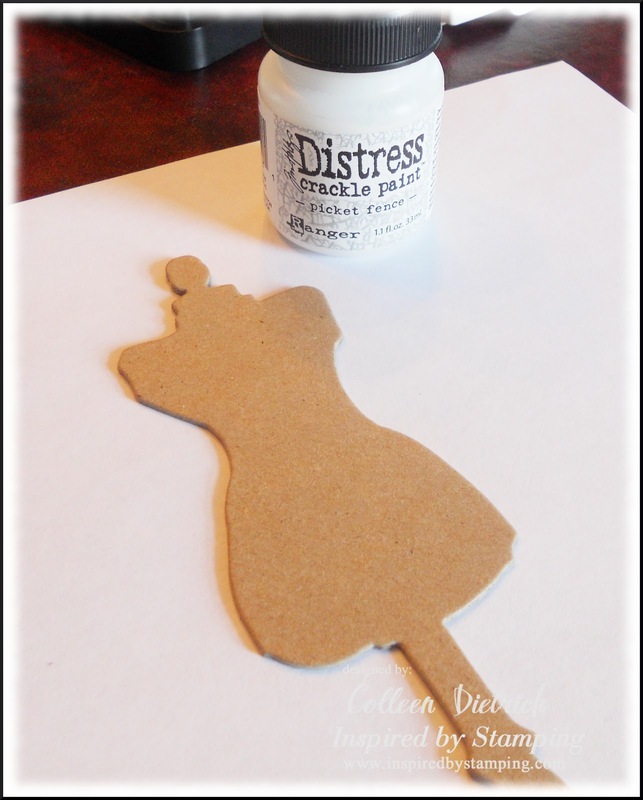 Turn the dressmakers form upside down on a piece of patterned paper that is also upside down, and trace with a pencil. After adhering the trimmed patterned paper skirt, it's time to glue on some pretty lace. This is a remnant from my stash. I added a bit of ivory braided trim to the waist (yes, it's quite high-waisted!) and then glued on a piece of a cheap pearl necklace. 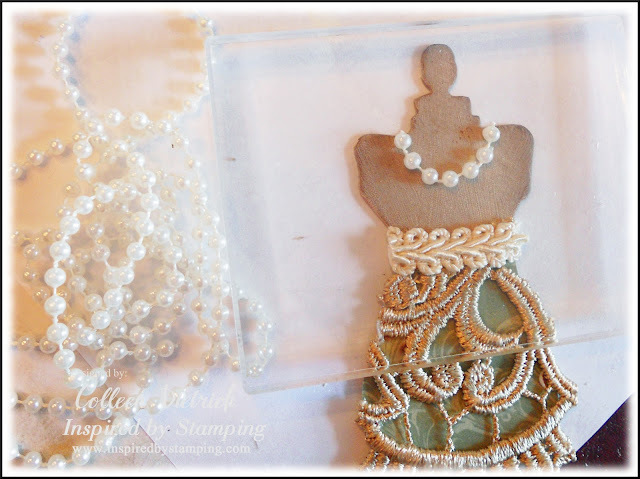 I set an acrylic stamping block over the pearls to apply pressure until the glue set. As a last minute idea, I sponged some white ink to the edges of the dressmakers form. I also added some BEAUTIFUL little pink roses from the Inspired By Stamping store (link at end of post). 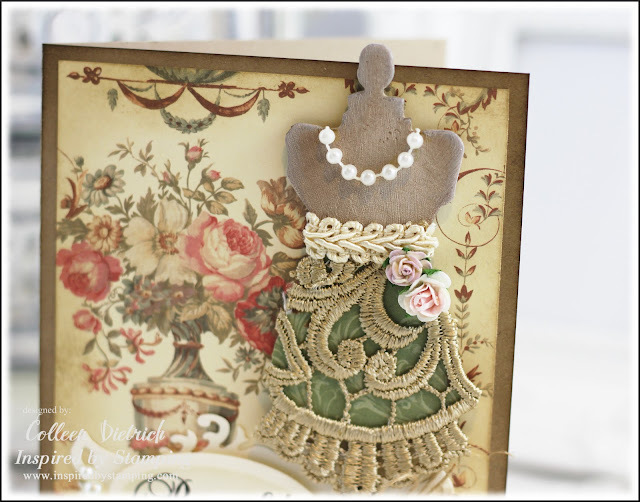 The patterned papers are retired Anna Griffin pieces, and gave such a Victorian flavor to this card. See the crackle on the stand? I stamped a portion of a sentiment from the Daisies set on this oval die cut, and gently shaded it with sage chalk ink. This is a peek inside the card. Thank you SO much for joining me here today! 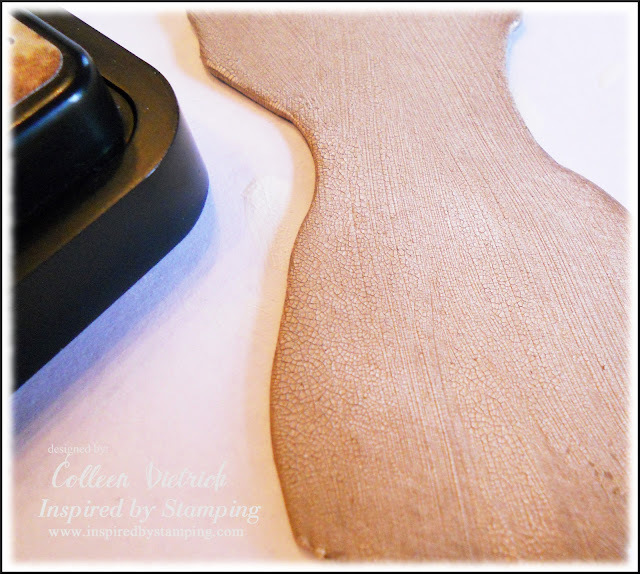 Please be sure to visit the Inspired By Stamping blog every Wednesday --- you never know what you might see. :o) And don't forget they are having a big sale during the entire month of September! Dimensions: 4 7/8" x 6.25"
Love, love, love the papers too! Simply gorgeous. Gorgeous, gorgeous, gorgeous! The paper, the dress form, that lace (OMG) I love I all! Simply stunning! I love the lace on the dress form and that paper is just perfect and soooooo beautiful. Another beautiful creation, Colleen. Wowwwwwwwwwwwww!! This is GORGEOUS!!!! I love love love what you did to the dress form and loveeeeeeeeeee the pearls!!!!! What an absolutely GORGEOUS dress form, Col! Yum! LOVE those trims! 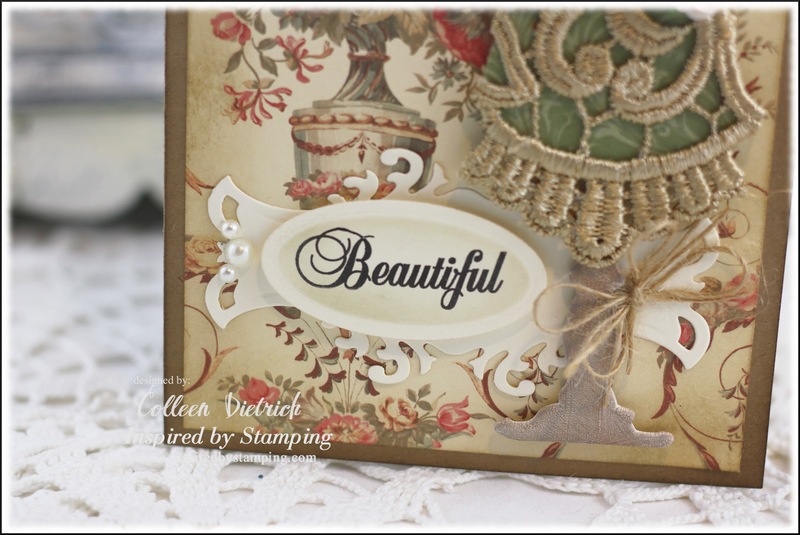 Beautiful vintage creation Colleen! I really really like the pretty fancy labels, might have to check into that LOL! You h ave turned into a seamstress, Colleen! Fabulous dress! Love the touch of pearls too. A delightfully vintage creation! Gorgeous card! I love how you altered the dress form! 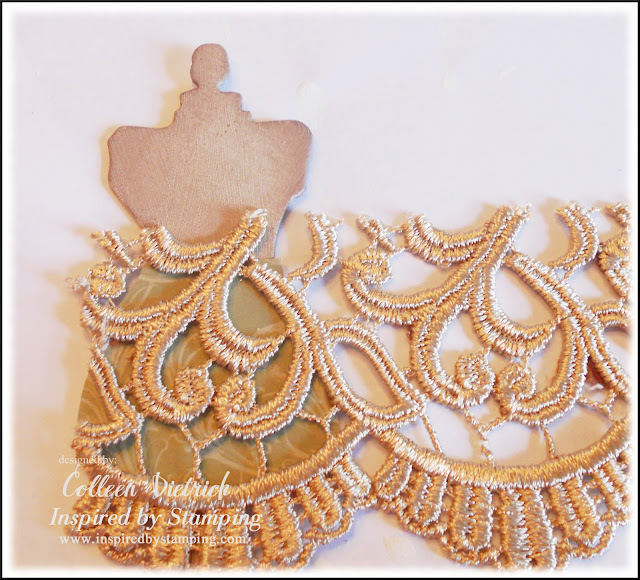 Oh Colleen, how wonderful, I love what you created and that lace "stunning." Thanks so much for visiting Colleen and for your lovely comments. Your words truly are heartfelt and I feel very grateful that they speak to you. What a gorgeous card. You do Victorian very well. I really enjoyed seeing all your photos on the process. Just a gorgeous card, Colleen. Thank you so much for th tutorial. Super super gorgeous inside and out! Love the dp, beautiful trims and accents! 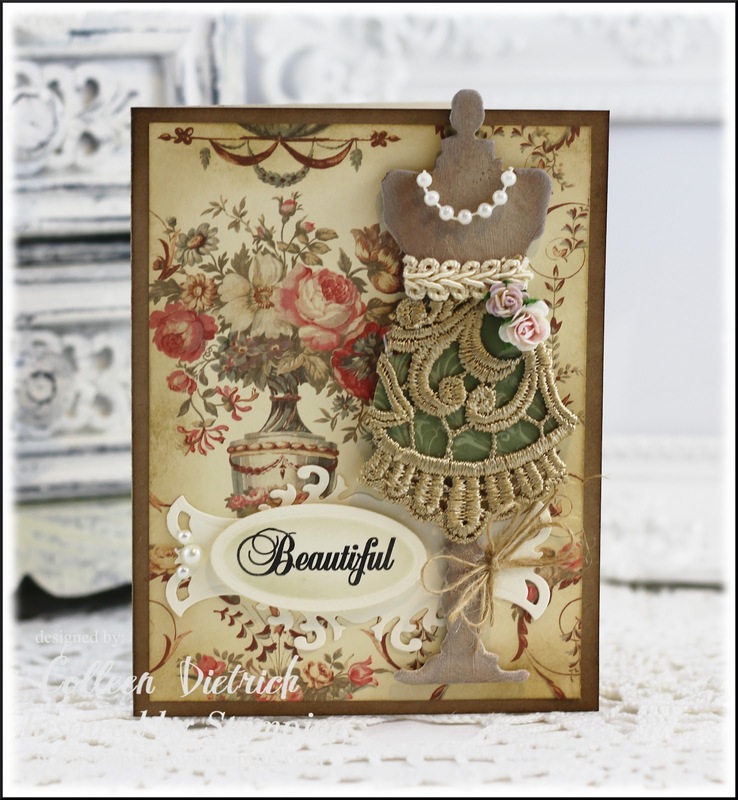 A perfect Victorian card...love it!!! Take care, hugs! Awesome idea Colleen! Love her skirt and pearls!! So pretty Colleen! Love the embellished dress form! So elegant looking! Bowl me over! Colleen this one is superb! I love everything going on. I always love your cards anyway...but wow! PS I changed my website a bit, like the name. "It's always SUNNY in TUCSON". Maybe you'll walk through and tell what you think? da. 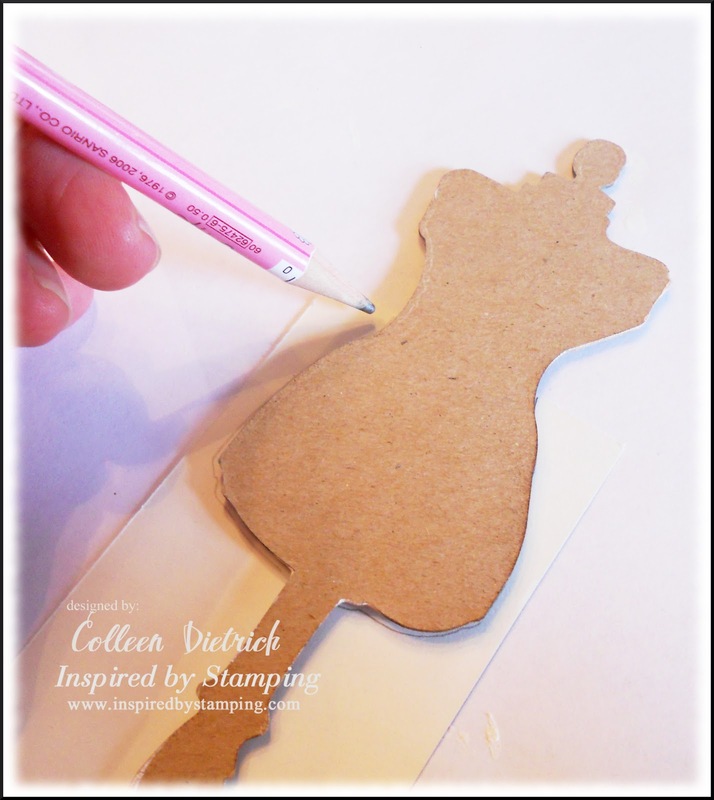 Wow-look at you with those chipboard dress form pieces. This looks amazing. I love the crackle paint-it looks so fabulous. You know years back this style dress was called an "Empire Waist" and it was one of my favorite. I always thought they made you look thin....lol How exquisite and just delightful. What fun, Colleen! I love how you showed the steps to dressing the mannequin. So clever! Beautiful is the right word for this!